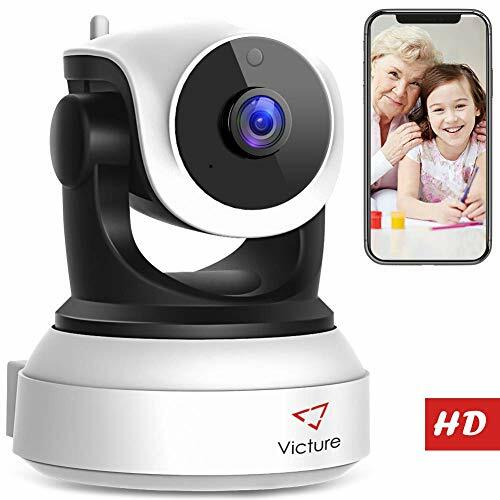 [STAY CONNECTED 24/7 WITH 360° HD PANORAMIC PROTECTION VIEW] Wide-angle glass lens 120°, horizontal 355°, and vertical 85° rotation range make 360° protection view. [FULL DAY PROTECTION WITH IR LED NIGHT VISION] Built-in 850nm Φ5mm IR LED beads create superior night vision capability. It allows you to see clear video images at night, in dark, or shaded areas. [2 WAY AUDIO ANTI NOISE] Built-in 48dB microphone and anti noise technology enables 2-way real-time conversations through the camera's speaker and mic. [SMART MOTION DETECTION] The motion sensors detect movements then instantly send alerts to your app and email. [MULTIPLE TERMINAL] You can not only set several positions in each camera, but also add several cameras in different terminals for this wifi camera. Adapt to IOS & Android,Windows. If you have any questions about this product by Victure, contact us by completing and submitting the form below. If you are looking for a specif part number, please include it with your message.